Our New and Exclusive “Roof Saver” Design Rack mounts to the OEM attachment points on the roof of your Nissan NV without drilling. We've taken our Ultimate Aluminum Ladder Rack and re-configured it to mount directly onto the OEM attachment points on the roof of the new Nissan NV van. 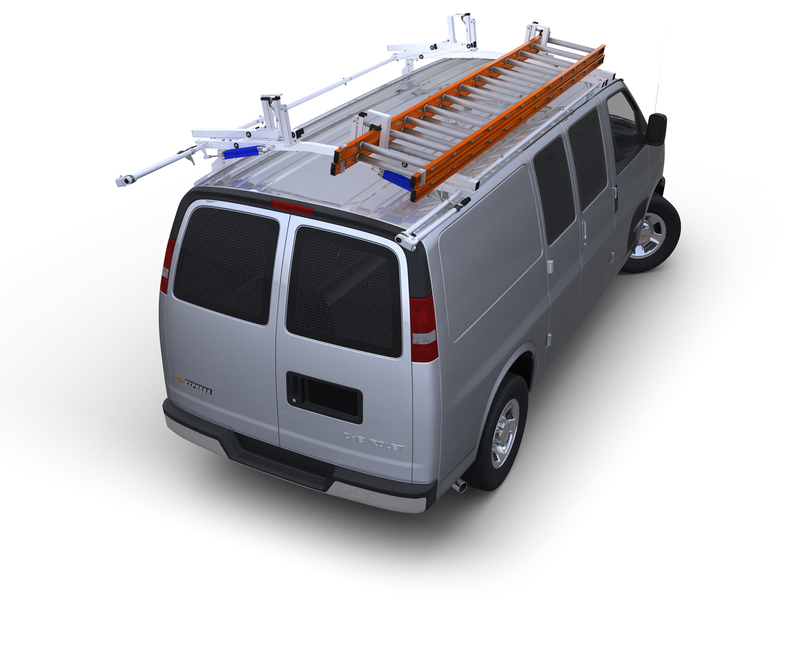 We've taken our Ultimate two cross support Aluminum Ladder Rack and re-configured it to mount directly onto the OEM attachment points on the roof of the new Nissan NV van. These attachment points have been provided by Nissan because the NV does not have traditional van "rain gutters" to facilitate mounting. As a result of using these attachment points the rear cross support of the rack sits nearly 24"(standard roof) or 20"(high roof) from the end of the roof which exposes the roof to possible damage in the loading and unloading process. To protect the roof of your Nissan NV van we have developed our exclusive "Roof Saver Extension" which extends out and over the roof's end to provide a load surface between your cargo and the vehicle. This all aluminum extension has a 2" x .125 wall aluminum roller bar at the rear of the extension that moves on high-density nonmetallic bearings, making it easy for one individual to load and unload long ladders and cargo. Loads are simply leaned up on the roller, lifted from an end and rolled up onto the rack. Due to the different positioning of the rear cross support and ultimately the extension bar, on standard roof vans versus high roof vans, we have developed "Standard" and "High Roof" versions of these aluminum ladder racks for Nissan nv with different extension arm lengths. Be sure to select the rack for the NV roof style you have. Adjustable ladder stops are also supplied for each cross support. Occasionally, due to changes in aerodynamics caused by the installation of ladder racks on a van, some vibration may occur. This can happen with any ladder rack and is not predictable. If you experience this problem, order our aluminum airfoil to help eliminate the vibration. This two cross support model is available in either a white or black powder coat finish.